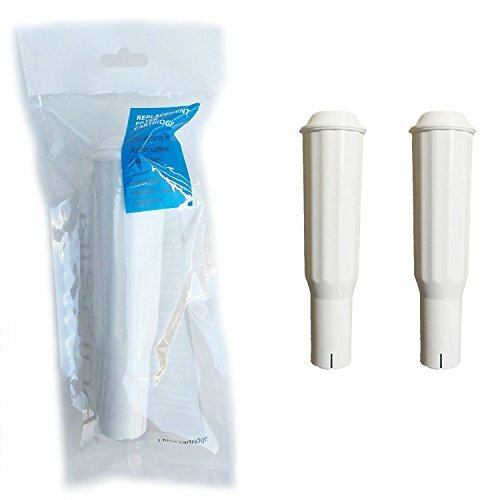 A premium water filter to replace the Jura Clearyl White filter. Fit Jura coffee models Z5, Z6, E8, E9, J5, F60, F8 & F7 & S9 One Touch and the S7 & S9 Avantgarde only. Quality meets or exceeds national leading brands with FDA and ROHS certified. For the models listed immediately below, if you have recently purchased a Refurbished Certified Pre-BrewedTM model (since about October 2010) or have had to replace your water tank, please check the water filter door flap that secures the filter in place before ordering. Each flap has a circular dial on it, so you can track the date of filter installation. If this flap is black, order the Clearyl White filter on this page; if it is Blue, order the Clearyl Blue filter. Jura-Capresso Impressa Series Machines: E8 E9 F7 F8 (If the flap on the F8 machine is black it is the Clearyl White filter and if the flap is blue it is the Clearyl Blue filter) F60 J5 S7 Avantgarde S9 Avantgarde S9 One Touch Z5 Z6. This Clearyl White Filter also fits C9 One Touch units that have a black flap door on the water tank (not blue). The much older Jura-Capresso Impressa-series machines use the Claris water filter, and newer ones use the Clearyl Blue filter. NOT TO BE USED WITH: Jura-Capresso ENA 3, ENA 4, or ENA 5, C5, J6, Z7, F9, C1000, C1300, C1500, C3000, EspressoPRO, or Bosch Benvenuto B20 or B30. Save you more money for the same great taste of coffee.